Creating a web page of my own seemed like a daunting idea, and is something that I have never tried. 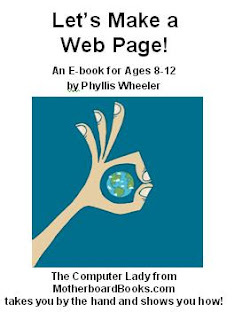 So, when the TOS Homeschool Crew members were given "Let's Make A Web Page," an e-book byPhyllis Wheeler at MotherboardBooks.com, I wondered if the instructions would be too technical. And *then* I realized that this e-book is designed for 8-12 year old children, and I predicted that it would be something I could handle. ;) Wheeler recommends that children have some familiarity with typing and word processing before using this product. In terms of children with developmental delays, please know that in addition to perspective taking (choosing to focus on a web page that would please the user or one that would please a reader), a good deal of reading is involved, with shifting attention required, a back and forth between the e-book and the web-page-in-process, too. I downloaded the 60 page e-book and handed it off to my 11 year old daughter, and in about an hour, she had designed her first web page! Wheeler walks the reader/web page creator through the process of creating a folder for the working document, and how to add background, text color, text, everything. The book is 60 pages long because it is full of illustrations that show the user *exactly* what the computer screen will look like, and which tab to open, which item to check, and how to change fonts. There is no guesswork -- the instructions are clear and simple! Wheeler explains how to add tables and photos and includes some troubleshooting in case a photo lands in the middle of your text. She guides the user through adding clip art, aligning the elements of the page, adding sound and hyperlinks. She walks the user through what NOT to do, also. I asked my 11-year-old daughter to tell me what she liked and didn't like. She really enjoyed learning to make a web page! She told me that liked the fact that "everything was explained clearly" for her; the book contains pictures of the little pop-up boxes that she would see on the screen; and the book provided web sites that she could go to for clip art and animations. She said that she didn't like the fact that "at times, there were several outcomes of one click with different servers", and she "was confused trying to find the correct outcome a time or two". At one point, she accidentally closed an important window and lost some work that had to be redone. In the end, that mix-up taught her what NOT to do. I don't think she'll make that mistake again! I see a lot of value in using this product with a child on the autism spectrum when used in a developmentally appropriate way. Most individuals on the autism spectrum enjoy computer related activities. Children with autism, particularly those with Asperger's Syndrome, tend to have special interests. 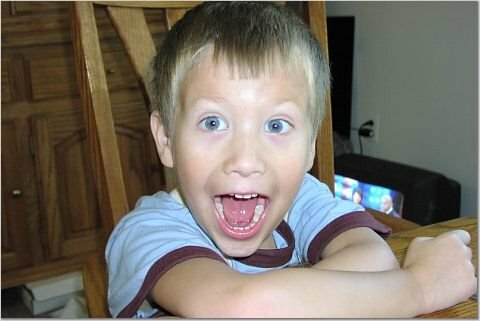 I am of the opinion that often, children on the autism spectrum do not NEED more time being reinforced for spending energy on a special interest for the sake of feeding a special interest--they NEED experience interacting with other people, and they NEED experience in perspective taking. I get a little bit excited when I think about the possibility of guiding a child through creating and comparing a web page composed of items HE/SHE likes to a web page he/she has created for someone else's interests! The "Let's Make a Web Page" could become a background activity that provides opportunity and experience in interviewing and perspective taking with others and self. The price for Let's Make a Web Page is $29.99. Currently this is discounted as an introductory special to $19.99. More TOS Homeschool Crew reviews are available here. Amy, I haven't seen the "dummies" book. I can tell you that M. created two web pages in an hour (she accidentally clicked on the wrong "x" and wiped out her work once, and she was almost finished, and had to start over). She was tickled to have created a web page with all sorts of stuff on it. I should have posted it for everyone, but I'd have had to change some of the photos (she has her friends on her page) first, and just didn't have the time to do that at the time I posted the review. Motherboard Books really makes the process easy to follow. I walked myself through it, too. But I have nothing to compare it to.